In the recently concluded SBS drama series “History of Salaryman“, Jung Ryeo Won played the role of granddaughter of Jin Shi Hwang, Baek Yeo Chi, who is appearing with a red hair and commands staffs aggressively. She recently told the story of “Jung Ryeo Won” in and out of the drama in the interview with bnt. In “Salaryman Chohanji”, Baek Yeo Chi who shouts “You’re fired!” regardless of men, woman or children as long as she is not satisfying appeared by dressing in simple and capable light-colored casual formal wear, reminiscent of Yoo Hee Jin in the TV series “My name is Kim Sam Soon” who has a tall and slender figure. But in the interview, reporter learned that: Jung Ryeo Won was suffering before she completely understood “Baek Yeo Chi,” to the extent of waiting to die. Because of difference in personality with Baek Yeo Chi, she had to spend a difficult time. In order to play well “Baek Yeo Chi who likes to call someone names,” Jung Ryeo Won pestered director Yoo In Sik without reserved, “Don’t give up on me, it’s director who cast me.” Practice after practice made Jung Ryeo Won into Baek Yeo Chi. From episode 5 and 6, Jung Ryeo Won who slept in the open and Baek Yeo Chi become one to perfectly interpret the amazing role of “Baek Yeo Chi”. 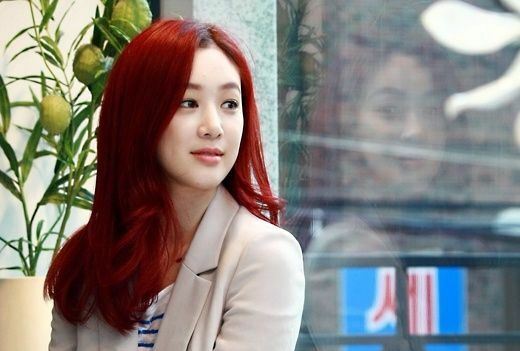 On the day, Jung Ryeo Won still appeared in the red hair of “Baek Yeo Chi.” In the drama, in order to play the role of “Baek Yeo Chi,” she dyed red hair for the first time in her life, and dyed for 14 times during the filming period. Why red? In this regard, Jung Ryeo Won mentioned heroine in American TV series “Desperate Housewives”, Bree Van De Kamp (played by Marcia Cross). Apart from recent TV series “Salaryman Chohanji”, the filmography of Jung Ryeo Won includes “My Name is Kim Sam Soon”, “Which Star Are You From” and movie “Never Ending Story”, “Pained”, “In Love and the War” and more. But comparing with dramas, the result of the movies are slightly unsatisfactory. In this regard, reporter also asked Jung Ryeo Won carefully about the box office for the movie. “Although there are movies that I starred in have good box office, but there are a lot more which has unsatisfactory box office, so I always feel that the I won’t be casting for role in movie, but the constant proposal by directors for me to star made me very grateful. They let me insist on doing I want to do, which itself is the gift to me. If the roles are loved by everyone, then that’s my reward,” Jung Ryeo Won used the remark to talk about her belief in the film. Normally the characters in TV drama series will change according to the views of audience, modifying the script before shooting, most of the actors is very afraid of such situation. “But ‘Salaryman Chohanji’ never received the script on the day, the script can be received at least 3 to 4 days beforehand, so I had ample time to prepare. If suddenly act the play which I do not know, then I am not fulfilling my responsibility to viewers.” Jung Ryeo Won who spoke the sentence was almost like returning to the role of Baek Yeo Chi in the drama, speaking out her ideas orderly. Through drama “Salaryman Chohanji”, Jung Ryeo Won reduced the “fear for the unknown,” and also changed herself who is careful and like to sulk, becoming a tougher person who is even more care about herself. Jung Ryeo Won who was debuting in 2000 as a member of four-member dancing group Chakra and later switched to become an actress used to tell the difficulties faced by singer-turned-actor in an entertainment program. Although it was made public earlier, but still want to hear the inside story of the heart of Jung Ryeo Won. “There are more people whom cooperated again but used to say that my color as singer is strong during the initial stage of acting career. Whenever I heard of ‘How to do it if without you, at that time don’t know, very sorry’, I feel satisfying and grateful, ths kind of feeling is really unique but also very interesting,” Jung Ryeo Won recalled tearfully the scene at that time, proving the injustice she suffered at that time. Jung Ryeo Won, who dropped out from school halfway because of the love for acting, leaving behind parents to come to South Korea alone, suffered from prejudice because of been singer. She even fasted and prayed with mother hoping to star in a drama, but still could not escape from the unspoken rules of the entertainment industry. Lee Seung Gi, boy band JYJ, girl band Girls’ Generation (YoonA, Yuri, Sunny, Jessica), miss A’s Suzy, T-ara (Jiyeon, Hyo Min, Eunjung), Children of Empire (ZE:A) and many other idol singers accounted for a place in TV series or movie, and continued to participate actively in singing activities. What’s the opinion of actress Jung Ryeo Won who is the early singer-turned-actor on this? “They are more hardworking than anyone else. Because knowing that most people still have prejudices, so work even harder. People fears change, at this time do not blame yourself, if there is people biases against you, then think of it as the person is in fear of failure. And also do not have expectations, treat the person who chose you as a man of courage, and has hope,” Jung Ryeo Won used these words to convey intimate advice to juniors.